This book was provided by the author’s publisher via my lady Blodeuedd’s excellent blog in return for an honest review. Just in case – I haven’t been compensated for writing the said review in any way and the fact that the book came free of charge didn’t influence me either. The novel is a creative version of the life of Asenath, the Egyptian wife of Joseph, the son of Jacob and Rachel from the Bible. You might remember him – he had a coat of many colours and was rather disliked by his half-brothers – and you most likely won’t remember her, as she is just mentioned once, as his wife and the mother of his two sons. We are given just a name and still the author managed to fill all the gaps with her vivid imagination. 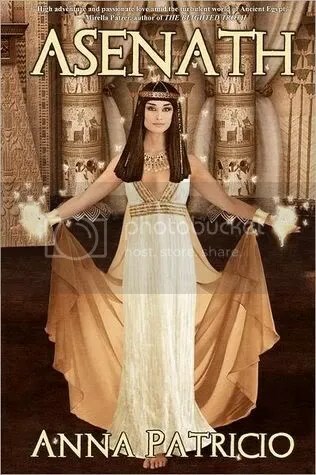 Asenath, according to Ms. Patricio, is an adopted daughter of a Heliopolis priest; before that she was a low-born peasant called Kiya; after an attack of foreign invaders and the death of her parents her life altered beyond recognition. Still her sad experience stayed with her, making her life as an aristocratic lady rather difficult. However, the same experience helped her find the love of her life – seeing a slave lying on the ground in scorching sun she didn’t hesitate one moment and let him drink some water. The same slave later will become a grand vizier of Egypt and her husband. It was a nice story and a book rather pleasant and easy to read. Written in the first person narrative it is a compelling tale of a stunning success of a simple peasant girl and a simple Hebrew slave – from rags to riches, nothing less. The book is geared definitely toward the Young Adult market and I suppose these readers will appreciate it the most, especially if they have read some Bible stories as well and are acquainted with Joseph and his story. The cover is rather nice as well – I like the colours! As I said, the fact that it is clearly an YA position influenced the way it was told. In my humble opinion it was too sanitized. Asenath/Kiya’s slavery time is glossed over; the authoress also kind of forgot that the initial intention of Joseph’s brothers was to kill him; only after the intervention of the eldest one, Rueben, who seemed to be the most level-headed and responsible at that time, they agreed to spare him and sell into slavery (the Elohist version) . The rest of them were mad of jealousy and hated Joseph’s guts just because he dared to be the favourite of his dad. I would also like to see more Egyptian court life and less teenage angst. I know the book was written from Asenath’s point of view but it would be more complex if another narrative voice was added and a new perspective with it. Finally let me say that many details of everyday Egyptian life seemed surprisingly modern. Asenath’s childhood friend proposes during an official function, kneeling before her…I am not sure it was done that way in ancient times. Asenath gets married dressed in white with a veil…not sure about that either. The pharaoh appologising to his subject – no way, he was the living god! In other words – if you want to find out more about the culture of ancient Egypt, it is not the right book. 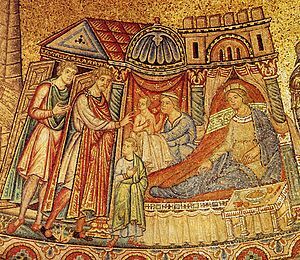 Let me also add that the story of Joseph’s near seduction by his master’s wife bears a marked similarity to the Egyptian story of the Tale of Two Brothers, which was popular at the time of Pharaoh Seti II (roughly 1200-1194 BCE). It has also been suggested that there are similarities between the rise to power of Joseph, and Manethos’ tale of Osarseph, who was Syrian born, and rose to be Vizier of Egypt, beginning his career under Pharaoh Merenptah and his son Seti II. Indeed the name Potiphar (Joseph’s master) may even be a version of Merenptah’s name (Poti = Ptah, Phar = Pharaoh). The “seven lean years” has been taken to refer to a Middle Eastern famine documented at that time. I liked the novel but only for its entertainment factor. The historical background was like that of any Disney movie (The Prince of Egypt anyone?) so not impressing at all. Still kudos for finding an interesting topic and an original heroine. This entry was posted in book review, historical, mini review, YA and tagged Anna Patricio. Bookmark the permalink. Jen it was just a little bit too similar to a fairy tale. The heroine gets hurt but not so much. Joseph is falsely accused and thrown to prison but we don't see his sufferings. Even teens know real life is not like that. I do like books for entertainment value, but not a big Disney "history" fan. 😛 So, I don't think this one is for me. I do understand Melissa, thanks for a visit! It does sound like some anachronisms crept into the text about the wedding and proposal. It is sometimes nice to try and give a voice to the voiceless but one also needs to take care that one is not simply appropriating their voice. It is an intriguing story idea though to tell the story from the Egyptian wife's point of view. @ The Red Witch – I couldn't agree more! I was even more stunned that Asenath was actually let to choose…@Blodeuedd – my pleasure and thanks for the opportunity!